Today I want to write one of the cutest animals in the world, the fennec fox. They are the smallest of all the foxes, with a full-grown adult weighing just 1 kg and growing up to 60 cm in length, half of which is their tail. Their very large ears are very useful. They help them to hear their prey, including insects that live under the sand. They also allow heat to escape, keeping them cool in the desert. They are omnivorous and eat a variety of animals and plants, including insects, scorpions, small mammals, birds, lizards and even small poisonous snakes. They are very nimble hunters and can jump very high for their size. They also get most of their water from their food. 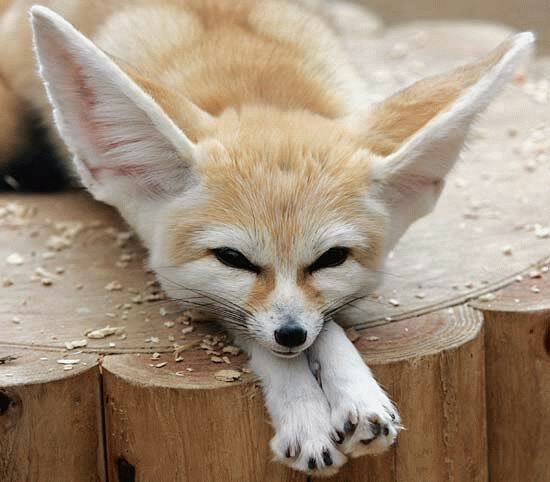 Fennec foxes are the national animal of Algeria and their national football team is named “Les Fennecs” after them. They live in the deserts of northern Africa and are still reasonably common throughout their range. Are there any other interesting facts that you would like to share about fennec foxes? Your post about fennec foxes is interesting. I had never heard of a fennec fox before reading it! I tried to find out more information about them and noticed that some websites talk about having fennec foxes as pets. It doesn’t seem quite right to keep them as pets, since they are important to the ecosystem. Do you know anything about this? I am a library teacher at an elementary school, and my third-grade class is looking at your blog because we are going to be blogging soon. Keep up the good work – your posts are very informative! Thanks Meredith, Hayden appreciates your kind comments. He also doesn’t think that keeping fennec foxes as pets is a good idea as they belong in he wild. Good luck with your class’s blogs and if they would like Hayden to write about their favourite animals, please feel free to let him know.